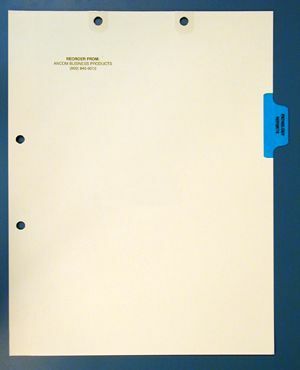 •8.5” x 11” manila index sheet constructed of 110# stock and two-hole punched along top as well as along left side. •Reinforced fastener holes that resist tearing. •Pre-printed blue tab constructed of Mylar. •Tab placed in position 3, along 11” side. For more information on this product, call Ancom at 800-845-9010 or e-mail us at request@ancom-filing.com.